My parents where visiting us when my baby pooped. My dad immediately said that he would change her and of course, I handed my baby over. I was so relieved I didn’t have to change one more poopy diaper! I don’t know what I dislike the most about having a kid in diapers: my baby trying to move as I change her diaper, the stinky diaper or opening the diaper pail and getting hit by an massive invisible cloud of poop smell. This last one is probably the worst. If you’ve ever changed a diaper then you know what I’m talking about. It’s been over 3 years of changing diapers and I have tried everything out there to get rid of the diaper pail smells. Luckily I have succeeded and I’m going to share with you what has worked for us. We use both disposable diapers and cloth diapers. For cloth we use Charlie Banana and they have a hybrid diaper system where you can use on layer of cloth and on top a small liner or a thin disposable pad. When we’re at home I mostly just use cloth but if we’re getting close to the time when my baby poops I’ll use a disposable. This means we have a diaper pail for the poop diapers and a bucket for the cloth diapers that are going to be washed later. The cloth diaper bucket doesn’t have a lid so keeping the smells under control is a must. I like to use clean, natural and non-toxic products in my home because I want to minimize the exposure of toxic chemicals in my children so all the tips, products and methods I tried are more natural ones. Not all of what I tried worked but you’ll be surprised at how well the products I’m going to mention have worked for us when it comes to stopping the stink! Put half of cup a baking soda at the bottom of the cloth diaper bucket or trash. Replace once a week with a new batch of baking soda. I have found this to be the less effective. Sprinkle baking soda inside trash bag of the diaper pail. Do this every time you place a new trash bag. Mix 1/4 cup of baking soda with 10 drops of essential oils and a tad of water until you create a paste. Place it inside a breathable bag, like the one pictured below, and place it at the bottom of your trash can or diaper pail. Make baking soda disks. Mix 1 cup of baking soda with 40 drops of your favorite essential oil. Add water little by little until you create a paste – don’t add too much water! Once it’s mixed well, put the mixture in a silicone mold. Wait 24-48 hours until it’s completely dry. Take it out of the mold and place at the bottom at your trash can. Replace every 2 weeks or so. Store the left over disks in an airtight glass jar. 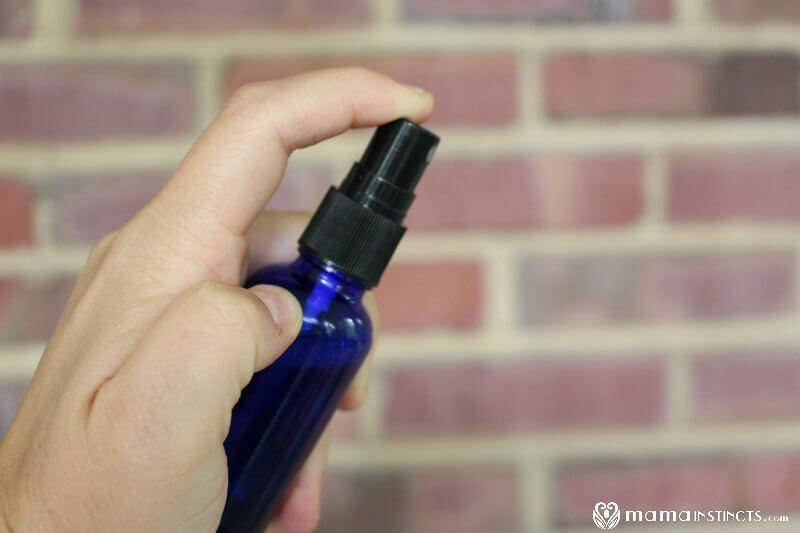 You can make an essential oil spray to fight those stinky odors. The best part is that you can use whatever scents you like best. We use NOW essential oils since they’re more affordable than other oils without compromising quality. In a 2 oz spray bottle, mix 1/2 tablespoon of vodka, 10-20 drops of your favorite essential oil and 3 tablespoons of distilled water. Shake it up and spray! You can add more essential oils if you want the scent to be stronger. Every time I change a diaper I spray the room so it smells nice! This is also great to keep in your bathroom – just tell everyone to spray away after they use the potty. Ever since I started making my own gel air fresheners my house smells amazing! I love keeping one next to our changing table so the room is always smelling nice and fresh. Click here to get the directions on how to make scented gel air fresheners. It is a lot easier than you think! They have some pretty interesting products that focus on removing bad odors. What I love about them is that they their products are not actually scented, they’re formulated to remove bad odors in your home in an odorless way. My favorite product is their Odor Neutralizing Granules – you just sprinkle it in your diaper pail or trash can to keep the stink away. You can even use these granules when your dog or kiddo has an accident. All you have to do is sprinkle it on the mess and clean it up. Another great product is their Every Day Odor Eliminator. This one is perfect to clean any accidents you kiddos might have so it’s great to have when you’re potty training! Fresh Wave has a wide range of products that make your house smell nice. They are safe, non-toxic and made with natural ingredients so if your kid (or pet) where to get to it, they would be fine. Fresh Wave is the only air freshener I’ve found that doesn’t use harsh chemicals, synthetic fragrances, doesn’t contain alcohol and are 100% Phthalate free. Fresh Pod: These stick to any surface and come with a small pouch inside that smells divine. Gel: These are small jars that contain gel that makes an entire room smell really nice. Spray: This is a scented spray you can use in your bathroom or after every diaper change. It only comes in one scent but it smells great. Those are my tips to get rid of the diaper pail smells! I really like all of these products not only because they work, but because they are safe and non-toxic. Have you found any other ways to remove poop smells from your diaper pail? Leave a comment!